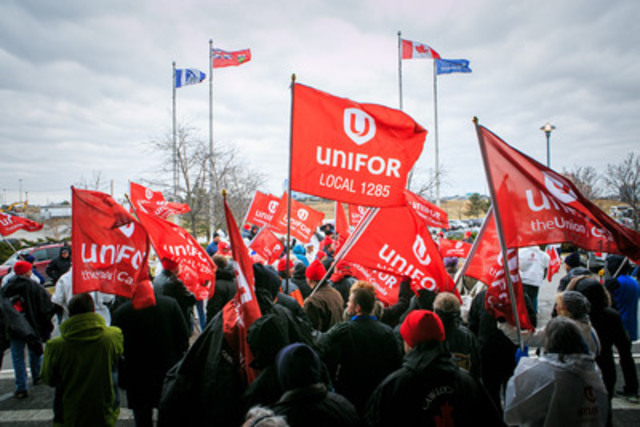 TORONTO, April 8, 2015 /CNW/ - Unifor members and allies from across Ontario rallied at the Greater Toronto Airport Authority (GTAA) to protest proposed outsourcing of services for seniors and passengers requiring wheelchair assistance. "Airlines can't provide top quality services with bottom dollar wages," said Jerry Dias, Unifor National President. "Unifor is standing up for good jobs at Pearson International Airport." Contract talks between Air Canada and Unifor were derailed last week because the GTAA is demanding that all work involving servicing passengers requiring wheelchair/special assistance be outsourced. "Our members work hard to provide important services to passengers," said Cheryl Robinson, Unifor Local 2002 President. "Job security is not too much to ask. The GTAA must end its campaign to turn good jobs into low-wage precarious jobs." Earlier in the morning, Unifor members conducted an information picket at Pearson terminals 1 and 3 to raise awareness among passengers about the behaviour of the GTAA. The GTAA has been in the media spotlight lately after Unifor accused it of "contract flipping"—the legal but unethical practice of switching service providers every few years to minimize costs. Every time a new contract begins, employees must re-apply for their job and face uncertainty and usually a pay cut. The GTAA was the target of two demonstrations about job security and low wages in March 2015. Unifor is Canada's largest union in the private sector, representing more than 305,000 workers. It was formed Labour Day weekend 2013 when the Canadian Auto Workers and the Communications, Energy and Paperworkers unions merged.